As one of my favorite authors has noted, we are in a post-Constitutional America. One example is the much-discussed and controversial Proposed Rule from CMS to incentivize end-of-life conversations. 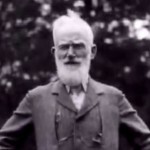 Bernard Shaw — Poster boy for shared decision-making? How perfect. Bernard Shaw as the spokesman for decision aids for terminally ill patients. I’m sure the irony was lost on the author of “The Judges Have Spoken: Decision Aid Upgrade Design Challenge Winners Announced” as she opened her story with a quotation from Shaw.